These are just a few of the common questions we have received over the years. If you have a more specific inquiry, please contact us using the button below. Your question has been received and we will be in touch as soon as possible. What is the difference between BST and traditional Art, Music, and Dance Therapies? |Creative Problem Solving Solutions | Do I really need therapy? | How BST Can Help | Which Therapist? |What is therapy like? |How about Insurance? | Confidentiality | Do you teach BST? | How can I incorporate BST methods into my own practice? What is the difference between BST and traditional Art, Music, and Dance Therapies? As a client, have you done traditional art, music, or dance therapy? Great! BRAINsmART builds on these expressive arts therapies using exercises that make a cognitive link to specific events and memories that have influenced your behavior, emotions, thoughts and core beliefs in the present. Traditional adjunctive therapies tend to be activity /action without providing a clear cognitive link that gives us the strategies to change patterns in behavior, emotion, and thought. There are many reasons why people want to start therapy, but therapy is a dynamic interpersonal process, so needs will change as the problems that bring you into the process get resolved. Sometimes, people come because they want to address a long-standing psychological issue that seems related to their current anxiety , anger, or depression. Other times it is in response to unexpected changes such as a divorce or work transition. Many seek the advice of counsel as they pursue their own personal exploration and need for increased self-awareness. Working with a therapist is a way to gain insight, support, and new strategies for changing patterns in your emotional, mental and interpersonal life. Therapy is a process of self-discovery and looking within to your personal resources as we move through depression, anxiety, conflict, grief, stress, body-image issues, and trauma from the past and present. Therapy is right for anyone who is interested in getting the most out of their life, increasing personal and interpersonal self-awareness, and facilitating change in their lives. It is during these overwhelming times, that we can learn how to ask for an outside opinion and determine if their advise works. Although it may feel uncomfortable at first, knowing when to ask for help is a sign of strength, especially if you have successfully navigated other difficulties in your life. You are in a better position to seek out extra support when you have enough self-awareness to realize that someone else could give you other options and perspectives that are not coming to you in a state of overwhelm. At these times, you are taking responsibility to seek out help by accepting where you're at while making a commitment to change. 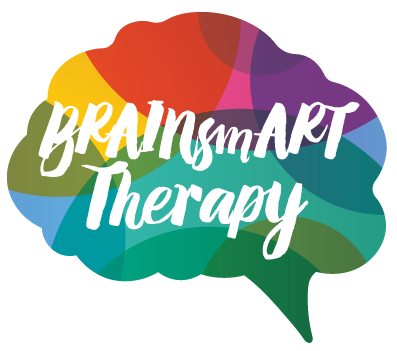 BRAINsmART Therapists provide you with practical strategies -engaging your mind, emotions and body that help you know your 'triggers' and re-direct self-harming 'knee-jerk' reactions into safe creative responses. How can BRAINsmART Therapy help me? Gain a deeper understanding of yourself, by acknowledging, accepting, and altering your patterns of thinking, feeling, and behaving. Develop creative skills and practices that increase self-awareness and interpersonal attunement. Learn creative outlets that can discharge your physiological stress and release emotions through brain-shifting exercises. Learn strategies that help you KNOW your triggers so you can control your reactions. Learn that EMOTIONS are not the ENEMY by safely exploring emotions and where they came from. Improve listening and self-reflection skills which promotes good communication. Learn to see your destructive patterns of behavior, accept that they were once 'adaptive and develop new pathways of creative action. Discover new modes of perception that help see problems and stress as opportunities. Which therapist would I be working with? Explain how you sort clients - criteria for who works with whom. What is BRAINsmART therapy like? Is Dr Nancy Lubow in network with my insurance plan? What are my mental health benefits under this plan? Do you teach BST methods to other therapists and clinicians? As a professional in the adjunct therapies (art, music, and dance), how can I incorporate BST methods into my own practice?